5 whole Potatoes Just boiled, peeled and sliced. For this recipe you will also need to make my vegan cheese sauce and my Vegan Ground Beef recipes prior to proceeding with this one. Before commencing with this recipe you will need a non stick frying pan, wooden spoon and an 8" x 8" (20 x 20cm) glass baking dish. First add the onion and garlic to your pan and apply a low to medium heat. Use some of the liquid from your canned tomatoes if needed to stop the onions sticking. Once the onions are lightly browned add the carrots and fry for a couple of minutes. Now add all the tomatoes, paste, herbs and spices and take the pan off the stove. Mix thoroughly. Finally, add the vegan ground beef from my prior recipe and mix through. 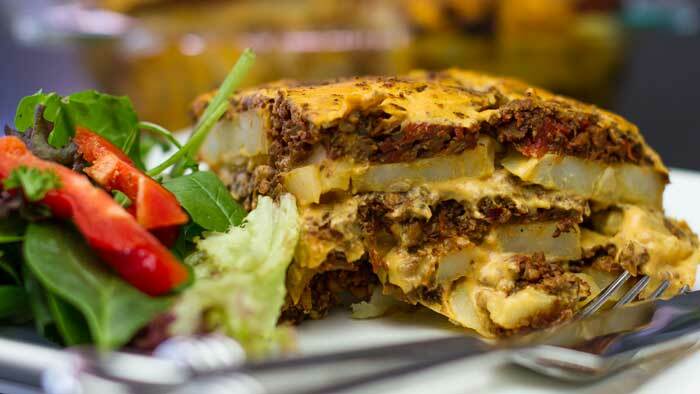 It's now time to get your oven pre-heating to 175 ° C / 350 ° F.
Take your glass baking tray and begin by lining it with a layer of sliced potatoes followed by the vegan beef mixture and then a generous layer of vegan cheese sauce. Repeat until the tray is full and finished with a sprinkle of paprika or nutmeg. Bake the Lasagne Potato Bake for 20 minutes until the vegan cheese has thickened and browned off nicely. Serve with your favourite salad, veggies...maybe some fresh bread? I am getting hungry!! My entire family loved it, and my son said he wants Potato Bake every Friday (I made it last Friday). I do suggest though, like you had in your video, to have the cheese sauce and ground meat made in advance. I made the entire thing in one day, all components, and it was a loooong day in the kitchen, but worth the effort. I did take a quick route and did not cook the carrots, tomatoes, onions, herbs and spices. Instead, I just mixed some jarred spaghetti sauce, herbs and spices in a bowl, then added the ground meat. Your recipe for the ground meat is absolutely superb! My husband loves it and I can’t wait to try it on pizza, in chili and in spaghetti sauce. I am a new vegan and cannot wait to make your goods. They look delicious. Sharing is caring and thank you for that.. This looks AMAZING! I love that your recipes use ingredients that are easy and readily available! Can’t wait to try this out!! This looks so good! I am planning on making it this week, but I think I’ll put a Mexican flair on it and cook my ‘ground beef’ with Mexican spices and the cheesy sauce I’ll add some jalapeno to it… Thanks for the great recipe! I made this today and everyone loved it! As someone else mentioned, it was a long day in the kitchen, so, I’ll be making some of it ahead of time to make it easier…wondering if the “meat” and “cheese” can be frozen? Thank you for sharing your recipes…we are really enjoying them!